Objective To evaluate the effectiveness and safety of switching to a second or third biological agent in juvenile idiopathic arthritis (JIA) after etanercept failure. Methods The Arthritis and Biologicals in Children Register aims to include all Dutch JIA patients who have used biological agents. Data on the disease course were used to estimate drug survival with Kaplan–Meier and calculate adverse event (AE) rates. Results Of 307 biologically naive JIA patients who started etanercept, 80 (26%) switched to a second and 22 (7%) to a third biological agent. During 1030 patient-years of follow-up after the introduction of etanercept, 49 switches to adalimumab, 28 infliximab, 17 anakinra, four abatacept and four trial drugs were evaluated. 84% (95% CI 80% to 88%) of patients who started etanercept as a first biological agent were, after 12 months, still on the drug, compared with 47% (95% CI 35% to 60%) who started a second and 51% (95% CI 26% to 76%) who started a third biological agent. Patients who switched because of primary ineffectiveness continued the second agent less often (32%, 95% CI 12% to 53%). After etanercept failure, drug continuation of adalimumab was similar to infliximab for patients with non-systemic JIA; anakinra was superior to a second TNF-blocker for systemic JIA. AE rates within first 12 months after initiation were comparable for each course and each biological agent. Conclusions Switching to another biological agent is common, especially for systemic JIA patients. A second (and third) agent was less effective than the first. The choice of second biological agent by the physician mainly depends on availability and JIA category. As evidence with regard to switching in JIA is scarce, we evaluated the effectiveness and safety of switching to other biological agents after failing etanercept during a long follow-up period. This study was part of a multicentre prospective observational register; the Arthritis and Biologicals in Children (ABC) Register. This register aims to include all Dutch JIA patients who use or previously used biological agents since the introduction of etanercept in 1999. The study protocol was approved by the Medical Ethics Committee at Erasmus MC Rotterdam and by all participating hospitals. The treating physicians collected and entered patient and disease characteristics in the web-based register at baseline, followed after 3 months of treatment, after 15 months and yearly thereafter.16 These data included the variables of the JIA disease activity score (ie, the JIA core set): physician's global assessment of disease activity on a visual analogue scale (VAS; range 0–100 mm, 0 best score), the childhood health assessment questionnaire (CHAQ; range 0–3, 0 best score) by patients/parents, including global assessment of wellbeing by a VAS, number of active and limited joints and erythrocyte sedimentation rate (ESR). In addition to the follow-up outcome data entered at 3 months and yearly thereafter, extra data entry times were at the time of any important events, such as stopping or switching biological agents and adverse events (AE). As a proxy for effectiveness of treatment, drug adherence until discontinuation due to ineffectiveness of treatment, AE or non-compliance was estimated with Kaplan–Meier. Patients were censored when discontinuation because of disease remission occurred, or when still receiving the drug at the time of last study visit. All medically important infectious and non-infectious AE and all serious adverse events (SAE, defined according to the US Food and Drug Administration) were documented. Flaring of JIA was not considered as an AE but as an outcome of treatment response. We calculated the overall AE rates (including SAE) and the SAE rates per patient-year within the first year after initiation of a biological agent, accounting for possible discontinuation of the biological agent. We limited our safety analyses to the first year after initiation of the biological agent, because the follow-up durations differed between the observed biological agents and AE rates are reported to be higher within the first year. We considered infections that recurred within a patient as separate AE, but non-infectious AE that recurred were counted only once. The multiple imputation method of the AregImpute function of the R statistical package was applied to impute missing values of the JIA core sets at observed follow-up moments. Only when at least three of the six JIA core set variables were present were the remaining values of the core sets imputed. For patients who switched from etanercept to a second and from a second to a third biological agent with lack of effectiveness as the reported reason (n=58 to a second and n=15 to a third agent), ACRpedi50 scores were calculated in order to categorise these patients as primary non-responder or partial responder. Five per cent of the JIA core set variables were missing at the start of etanercept (median of 0 missing variables per core set; IQR 0–0) and 34% at the start of the second agent (median of two missing variables per core set; IQR 2–4). A total of 244 follow-up visits was recorded, of which 128 visits were used in order to categorise these patients. Missing during these follow-up visits were: 26% of the variables and a median of 0.5 missing variables per core set (IQR 0–2.5). Of all patients who switched to the second agent because of lack of effectiveness, inactive disease was calculated at the fixed follow-up visits after 3 and 15 months of treatment. Forty-six of the 58 patients had a 3-month follow-up visit and 24% (11 of 46) of the ESR values, 7% (three of 46) of the reported active joint counts and 44% (20 of 46) of the physician's global assessments for disease activity were missing. Forty-three patients had a follow-up visit 15 months after switch, and 37% of the ESR values, 33% of the reported active joint counts and 65% of the physician's global assessments for disease activity were missing. Descriptive statistics were reported as absolute frequencies, or as median values with an IQR. Depending on the tested baseline variable, Mann–Whitney U tests and χ2 test were used to perform comparisons between patients who switched and patients who never switched. In addition, a logistic regression was performed to adjust the associated factors for follow-up duration since the start of etanercept, which was thought to be an important confounder. Another logistic regression was performed to identify the association between the reason to discontinue a second agent and the reason to switch from a first to a second biological agent. Results of the logistic regression models are presented as OR with 95% CI, and p values were calculated using the Wald's test. Differences in drug continuation (according to Kaplan–Meier) were defined by the log-rank test when comparing two groups and by the log-rank Mantel–Cox when comparing multiple groups. All reported p values were based on two-sided tests for significance, and p values less than 0.05 were considered statistically significant. SPSS V.17.0.1 and R statistical package 2.10.1 were used for the analyses. Of the 307 JIA patients included, 80 (26%) switched to a second and 22 (7%) to a third biological agent. A flow chart of switching patterns is given in figure 1. Patient and disease characteristics are listed in table 1. Median follow-up duration since the start of the second biological agent was 18 months (IQR 7–38), and since the start of the third 14 months (IQR 6–35). Adjusted for follow-up duration, patients who switched to a second biological agent were more likely to have the systemic category, had shorter disease duration before the start of etanercept and were younger at the start of the first biological agent, and at the start of etanercept had higher CHAQ scores. Reasons for a switch to a second or third biological agent are reported in table 2. Lack of effectiveness of treatment was the most frequently reported reason for both switches. (A, B) Flow-chart of switching between biological agents recorded in the Arthritis and Biologicals in Children Register. The recorded follow-up duration (patient-years) since start or switch are reported below that specific start or switch (eg, 68 patient-years of follow-up were recorded since switch to adalimumab in non-systemic juvenile idiopathic arthritis patients). aba, abatacept; ada, adalimumab; ana, anakinra; etn, etanercept; FU, follow-up; infl, infliximab. 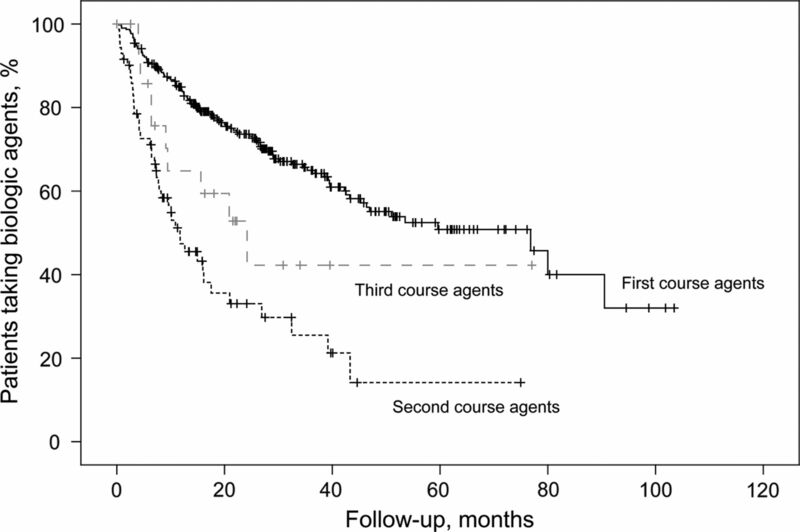 Most patients experienced no treatment pause between the discontinuation of a biological agent and introduction of another biological agent, 17 patients started the second agent after a median biological treatment pause of 8 months (IQR 2–32), and 12 patients started the third agent after a median biological treatment pause of 4 months (IQR 2-22). The biological treatment pause seemed mainly caused by the limited availability of other biological agents during the observed time period and the occurrence of SAE as a reason to discontinue biological treatment. The drug survival of the first, second and third introduced biological agents is reported in figure 2. Eighty-four per cent (95% CI 80% to 88%) of patients who started etanercept as a first biological agent were, after 12 months, still on the drug, compared with 47% (95% CI 35% to 60%) of patients who started a second biological agent and 51% (95% CI 26% to 76%) of patients who started a third biological agent. Drug continuation of first, second and third course of biological agents. Kaplan–Meier estimate of overall drug continuation until discontinuation of the first, second and third introduced biological agent due to ineffectiveness, adverse events or non-compliance. Vertical lines indicate censoring (censoring is defined as the time a patient discontinued etanercept because of disease remission or, when still receiving the drug, the time of last study visit). Log-rank test (Mantel–Cox) compares the overall drug survival differences between the three courses of biological agents. *Two patients who used a trial drug as a second biological agent had to be excluded. **Two patients who used a trial drug as a third biological agent had to be excluded. The majority of patients with non-systemic JIA categories switched between anti-TNFα agents only. These patients discontinued adalimumab because of ineffectiveness or AE in 21 of the 42 times it was started as a second/third biological agent, and infliximab in nine of the 21 times it was started as a second/third biological agent. 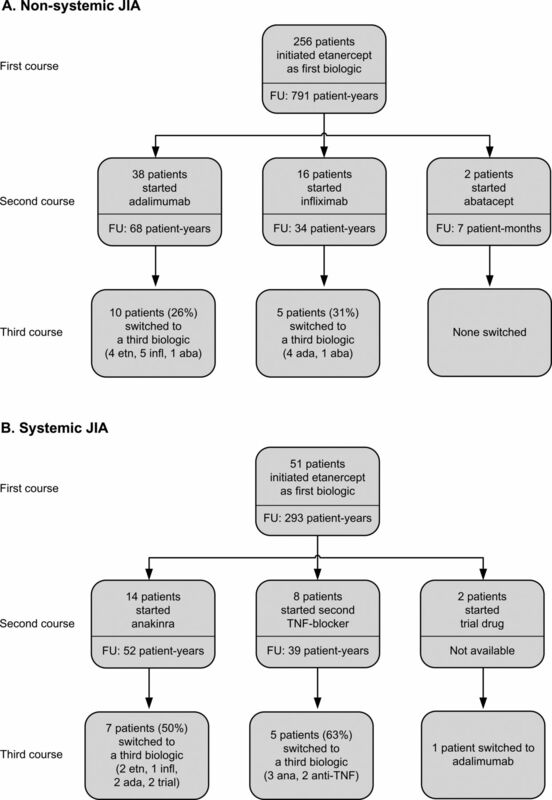 Drug survival of the adalimumab courses in JIA patients with non-systemic JIA categories (50% on drug after 12 months, 95% CI 32% to 67%) was not different compared with the infliximab courses (54%, 95% CI 28 to 79, log-rank p=0.50, figure 3A). Systemic JIA patients most often started anakinra after etanercept failure (17 times of anakinra as second/third biological agent). All systemic JIA patients who started adalimumab discontinued it due to ineffectiveness or intolerance, six of seven patients (86%) discontinued infliximab and 11 of 17 patients (65%) anakinra. After etanercept failure, systemic JIA patients continued anakinra (65% on drug after 12 months, 95% CI 42 to 87) more often than a second TNFα antagonist (21%, 95% CI 0 to 43, log-rank p=0.006). Drug survival of anakinra as a second/third agent was not different from drug survival of etanercept as a first agent (figure 3B). Drug continuation of biological agents introduced in systemic juvenile idiopathic arthritis (JIA) and non-systemic JIA categories. Kaplan-Meier estimate of overall drug continuation until discontinuation of the agent due to inefficacy or adverse events. Vertical lines indicate censoring (censoring is defined as the time a patient discontinued etanercept because of disease remission or end of follow-up). (A) Compares the drug survival of etanercept (introduced as the first biological agent) with adalimumab and infliximab as the second/third introduced agents for patients with non-systemic JIA categories. (B) Compares the drug survival of etanercept (introduced as the first biological agent) with anakinra, adalimumab and infliximab as the second/third introduced agents for patients with systemic JIA. Log-rank test compares the drug survival difference between the second/third introduced biological agents (*marked categories). Forty-six of the 58 patients who switched to a second agent due to lack of effectiveness had follow-up data 3 months after switch, for two patients too many variables were missing and two of the remaining 44 patients (5%) achieved inactive disease. Of the 43 patients with 15 months of follow-up, unfortunately for 14 patients too many variables were missing, and five of the remaining 29 patients (17%) achieved inactive disease. Patients who switched to a second biological agent because of primary non-response to treatment (n=24, two patients excluded because of inclusion in a drug trial) seemed to continue the second agent less often (32% on drug after 12 months, 95% CI 12% to 53%) than patients who switched because of partial response (50% on drug after 12 months, 95% CI 30% to 70%) and the remaining reasons combined (61% on drug after 12 months, 95% CI 38% to 83%). Discontinuation of a second biological agent because of lack of effectiveness was associated with lack of effectiveness as a reason to switch from the first to the second agent (OR 8.0, 95% CI 1.7 to 37.4), but not with AE as a reason to switch from the first to the second biological agent (OR 0.1, 95% CI 0.0 to 1.1). Of the eight patients who switched to a second agent because of uveitis, all switched to adalimumab. Median drug survival on adalimumab for these patients was 11.7 months; four patients (50%) discontinued adalimumab (two because of a flare of arthritis, one because of AE and one reason unknown). Very few patients switched because of safety issues from etanercept to the second agent (11 of 307 patients) and from the second to the third agent (five of 80 patients). Within 1 year after the start of etanercept as the first biological agent, 0.23 AE/patient-year and 0.01 SAE/patient-year (0.55 AE/patient-year of patients who switched) were reported, and within 1 year after the start of the second biological agent 0.32 AE/patient-year and 0.00 SAE/patient-year, and of the third biological agent 0.36 AE/patient-year and 0.00 SAE/patient-year. 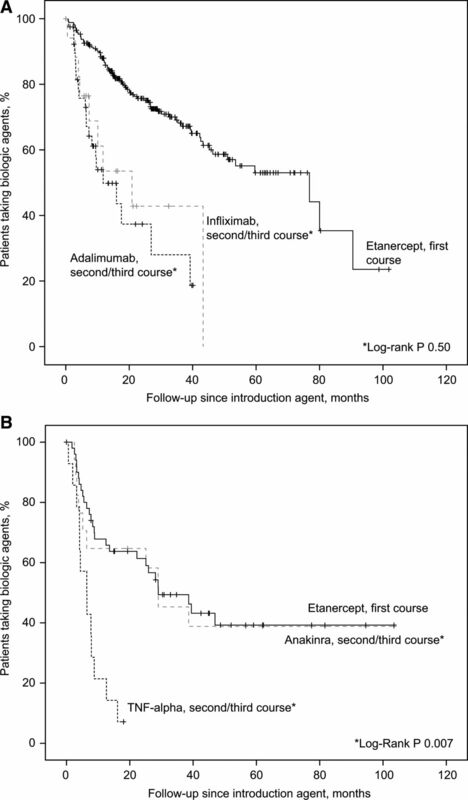 Within the first year, 0.42 AE/patient-year during the 49 adalimumab courses were observed, 0.19 AE/patient-year during the 28 infliximab courses and 0.32 AE/patient-year during the 17 anakinra courses. In this study we show that switching to a second biological agent in JIA occurs frequently in daily practice and seems to be a safe option for JIA patients who fail etanercept. The effectiveness of a second (and third) biological agent is debatable and seems especially low when the first biological agent was discontinued because of primary ineffectiveness. This is the second observational study on the effectiveness and safety of switching between biological agents in JIA. In the present study, most patients switched from etanercept to adalimumab, while in the study by Tynjala et al1 mainly a switch between etanercept and infliximab was described. We showed that, while JIA patients continued etanercept as a first biological agent more often, 47% of the switchers, who previously did not responded to etanercept, continued their second biological agent after 12 months of treatment. A lower percentage (32%) was seen for patients who discontinued etanercept because of primary ineffectiveness. This drug survival rate of a second biological agent is slightly lower than the 58% reported by Tynjala et al.1 The number of patients who achieved inactive disease 15 months after switch (17%) was substantially lower than the reported 32% in previously biologically naive JIA patients treated with etanercept.3 In rheumatoid arthritis (RA), a meta-analysis with over 4000 RA patients has been conducted and a drug continuation rate of 61.8% 1 year after the introduction of a second TNFα antagonist of treatment seemed higher than in JIA.19 In that study the percentage of RA patients achieving inactive disease was not reported, but an ACR70 response was reached in only 14% of patients. While a first biological agent was more effective, switching seems justifiable, because only very limited other therapeutic options are available after biological treatment. The question remains: ‘Which patients should switch and to what type of biological agent?’ We have shown that, in daily practice, patients with non-systemic JIA categories mainly switched between TNFα inhibitors only. An important observation was that, for patients with non-systemic JIA categories, no differences between the effectiveness of adalimumab versus infliximab after etanercept failure were seen. Abatacept, even though it has been approved after TNFα failure, was only used in four patients, which is largely influenced by the limited availability of abatacept within the study period. The majority of the patients with systemic JIA switched between etanercept and anakinra. After etanercept failure, anakinra was superior compared with a second TNF-blocker. Anakinra now has a more prominent place in the treatment of systemic JIA with systemic features and is often the first choice biological agent.15 Other IL-1 and IL-6 antagonists were, besides prescriptions in the presence of randomised clinical trials, not available during this study period and therefore were not observed in the present study. Another observation was that patients who switched to a second biological agent with uveitis as the reason, all switched to adalimumab. A study by Simonini et al20 recently showed that adalimumab seems to be more efficacious in maintaining uveitis remission than infliximab. Unfortunately, the evaluation of the effectiveness on uveitis is beyond the scope of our register. In this study we showed that the AE rates are comparable for each course of biological agents, and are also comparable for each specific biological agent. This is in contrast with data from Curtis et al,21 who showed a higher rate of hospitalised infections in switchers compared with RA patients who did not switch and a higher rate of hospitalised infections with infliximab use compared with the use of other available biological agents. Furthermore, we showed that AE as a reason to switch from a first to a second agent did not influence the chance of discontinuation of the second agent for AE; however, the number of patients with AE was small. Our finding that switching between biological agents in JIA in our study was not associated with an increased safety risk is reassuring. This prospective observational study has some limitations. Because of the observational study design, reflecting a real-life setting, the choice of treatment is subject to the preferences of the treating physicians. The observed switching patterns are inevitably influenced by the availability of biological agents within the study period. The register started when etanercept became available for the treatment of JIA, and other biological agents were introduced later, which will have had an effect on the treatment choices of physicians. Furthermore, the study period is limited until the patients become 18 years of age. For patients followed for a longer period after the start of etanercept, we had a higher chance to observe a switch. The percentage of switching in this observational study is likely to be underreported. Therefore, together with the low number of patients per introduced biological agent and the uncontrolled nature of an observational study, these indirect comparisons between the different biological agents are difficult and should be interpreted with care. Furthermore, clinicians are allowed to start or discontinue concomitant medications during the observed periods. The strength of this observational study is a reflection of daily clinical care; however, the lack of evaluation of these concomitant medications should be noted. The switchers represent a heterogeneous patient group. The presence of systemic features, uveitis and anti-drug antibodies are all important factors that influence treatment choices of the physicians and could affect treatment responses. In further studies these should all be taken into account to identify the best strategy of switching for each individual patient. In conclusion, switching from etanercept to a second biological agent occurs frequently in daily practice and, as limited options are available, seems justifiable for JIA patients who fail etanercept. After etanercept failure, adalimumab and infliximab were equally effective in JIA patients with non-systemic JIA categories, while anakinra was superior to a second TNFα blocking agent in systemic JIA. The effectiveness of a second biological agent was lower than the first biological agent and seems especially low when the first agent was discontinued because of primary ineffectiveness. The choice of second biological agent by the physician mainly depends on availability of biological agents and the JIA category.
. Drug survival of the first and second course of anti-tumour necrosis factor agents in juvenile idiopathic arthritis. Ann Rheum Dis 2009;68:552–7.
. Duration of etanercept treatment and reasons for discontinuation in a cohort of juvenile idiopathic arthritis patients. Rheumatology (Oxford) 2011;50:189–95.
. Factors associated with treatment response to etanercept in juvenile idiopathic arthritis. JAMA 2011;306:2340–7.
. Anti-TNF-alpha therapies: they are all the same (aren't they?). Rheumatology (Oxford) 2005;44:271–3.
. Binding and functional comparisons of two types of tumor necrosis factor antagonists. J Pharmacol Exp Ther 2002;301:418–26.
. Anakinra as first-line disease-modifying therapy in systemic juvenile idiopathic arthritis: report of forty-six patients from an international multicenter series. Arthritis Rheum 2012;64:557–67.
. A multicentre, randomised, double-blind, placebo-controlled trial with the interleukin-1 receptor antagonist anakinra in patients with systemic-onset juvenile idiopathic arthritis (ANAJIS trial). Ann Rheum Dis 2011;70:747–54.
. The efficacy and safety of interleukin-1-receptor antagonist anakinra in the treatment of systemic juvenile idiopathic arthritis. Expert Opin Biol Ther 2010;10:1743–52.
. Anti-tumor necrosis factor alpha switching in rheumatoid arthritis and juvenile chronic arthritis. Arthritis Rheum 2004;51:301–2.
. Use of infliximab in patients with systemic juvenile idiopathic arthritis refractory to etanercept. Clin Exp Rheumatol 2005;23:545–8.
. Use of adalimumab in patients with juvenile idiopathic arthritis refractory to etanercept and/or infliximab. Clin Rheumatol 2009;28:985–8.
. Switching the therapy from etanercept to infliximab in a child with rheumatoid factor positive polyarticular juvenile idiopathic arthritis. Mod Rheumatol 2007;17:526–8.
. 2011 American College of Rheumatology recommendations for the treatment of juvenile idiopathic arthritis: Initiation and safety monitoring of therapeutic agents for the treatment of arthritis and systemic features. Arthritis Care Res (Hoboken) 2011;63:465–82.
. Development of a web-based register for the Dutch national study on biologicals in JIA: www.ABC-register.nl. Rheumatology (Oxford) 2008;47:1413–16.
. Clinical relevance of switching to a second tumour necrosis factor-alpha inhibitor after discontinuation of a first tumour necrosis factor-alpha inhibitor in rheumatoid arthritis: a systematic literature review and meta-analysis. Clin Exp Rheumatol 2011;29:96–103.
. Prevention of flare recurrences in childhood-refractory chronic uveitis: an open-label comparative study of adalimumab versus infliximab. Arthritis Care Res (Hoboken) 2011;63:612–18.
. The comparative risk of serious infections among rheumatoid arthritis patients starting or switching biological agents. Ann Rheum Dis 2011;70:1401–6. Contributors Author access to data: MHO and LWAvSS had full access to all data and take responsibility for the integrity of the data and accuracy of the analyses. Study concept and design: LWAvSS and MHO. Acquisition of data: LWAvSS, MHO, JA, FHMP, WA, RtC, EPAHH, YKK, SLG, KMD, JFS, JMvB, NMW, MAJvR, SK and PAvP. Analysis and interpretation of data: MHO and LWAvSS. Drafting of the manuscript: MHO and LWAvSS. Critical revision of the manuscript for important intellectual content: MHO, LWAvSS, FHMP, JA, WA, RtC, EPAHH, YKK, SLG, KMD, JFS, JMvB, NMW, MAJvR, SK and PAvP. Statistical analysis: MHO performed the statistical analysis and together with LWAvSS takes responsibility for the accuracy of data analyses. Obtained funding: LWAvSS. Administrative, technical, or material support: MHO, LWAvSS, FHMP, JA, WA, RtC, EPAHH, YKK, SLG, KMD, JFS, JMvB, NMW, MAJvR, SK and PAvP. Study supervision: LWAvSS. Funding The Dutch Board of Health Insurances (from 2003 to 2006), Pfizer BV (formerly Wyeth International BV, since 2007) and Abbott BV (since 2010). Support was unconditional, and there was no role in study planning, design, management, data analyses, interpretation of the data, and preparation or approval of the manuscript. Competing interests All authors have completed and submitted the ICMJE form for disclosure of potential conflicts of interest. MHO received outside the submitted work travel grants from Pfizer (formerly Wyeth), and support for consultancy from Roche. FHMP: no financial disclosures with regard to the submitted work, outside the submitted work she received consultancy fees from Roche, travel grants from Pfizer (formerly Wyeth), and grants for thesis from Abbott, Bristol-Myers Squibb, Novartis, Tevapharma and Pfizer (formerly Wyeth). LWAvSS: received grants for the submitted work from the Dutch Board of Health Insurances, Pfizer (formerly Wyeth) and Abbott, received consulting fees and support for travel to meetings from Pfizer (formerly Wyeth). Outside the submitted work she received consultancy fees from Roche and Novartis, grants from the Dutch Arthritis Association and travel expenses from Bristol-Myers Squibb. RtC: received outside the submitted work grants, support for travel, and consultancy from Pfizer (formerly Wyeth). NMW: received outside the submitted work payment for lectures from Novartis. JA, WA, KMD, SLG, EPAHH, SK, YKK, JFS, JMvB, PAvP and MAJvR: no financial disclosures reported. Ethics approval The study protocol was approved by the Medical Ethics Committee at Erasmus MC Rotterdam and by all participating hospitals. Data sharing statement Additional unpublished data are not available for persons not involved in the Dutch Arthritis and Biologicals in Children Working Group.